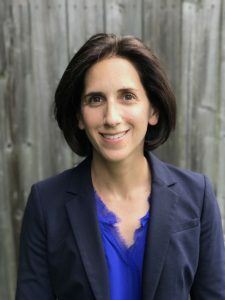 The Jewish Historical Society of Greater Washington has announced the appointment of Kara Blond as the Society’s new Executive Director, effective September 2017. Blond is currently Director of Exhibitions at the Smithsonian Institution’s National Museum of Natural History. She will lead the Society’s day-to-day operations and the planning, design, construction, and programming of the Lillian & Albert Small Jewish Museum in a new building adjacent to the Capitol Crossing Project under construction in downtown Washington. The Museum will incorporate the Society’s historic 1876 synagogue, the region’s first and oldest purpose-built synagogue building. Planning for the new Museum will continue over the next few years in conjunction with a major capital campaign. Blond brings nearly 15 years of experience managing complex, transformational exhibitions as part of significant construction projects at major national institutions. At the National Zoo she served as the exhibition developer and project manager on such visitor favorites as the Asia Trail and Elephant Trails. At the National Museum of Natural History, where she has served as Director of Exhibitions since 2013, Blond has been responsible for overseeing design and development of experiences across 350,000 square feet of public space. At the Smithsonian, she has overseen more than 30 exhibitions, including the redesign of the National Fossil Hall and the broader Deep Time Initiative. Her work has been recognized with both national and Smithsonian-wide awards. Blond succeeds Laura Apelbaum, who led the Society for 22 years, from 1994 to 2016, as Executive Director. Wendy Turman, Deputy Director, has been leading the staff and operations of the Society since August 2016 and will continue doing so until Blond begins work on September 5. For more information please contact Board President Russell Smith at president@jhsgw.org or (202) 303-1116, or Search Committee Chair Adam Rubinson at arubinson@deloitte.com or (202) 491-7005.